I made 11 of them, all of them a little different. It was so much fun inking, stamping, spritzing, crumpling, sewing and using beeswax on cardstock, coffee filters, tissue paper, mica and anything else I could get my hands on! This ATC happened to fit the theme for the monthly challenge on the Ranger Yahoo Group, so I posted it. They are so nice over there, I should participate and contribute more often. One of the ladies on the group asked how I made the ATC, so I will post the steps here too. For the background paper, I used the direct to paper technique to apply milled lavendar, tattered rose and dried marigold distress inks to my white cardstock. I sprayed the inked paper with water using my mini mister and then swished (like that technical term?!) my paper through a puddle on my craft mat (the puddle consisted of milled lavender ink directly on the mat, spritzed with water and a "z" scribble of goldenrod stickles) until fully covered. I dried the paper with the heat gun until damp. I then crumpled it up into a small ball and re-opened it, smoothed it out, and then sprayed it with a mini mister of water that I had added a couple of dips (using the wet tubing from the bottle) of sunflower sparkle perfect pearls, covering it completely. I used the heat gun to dry it. 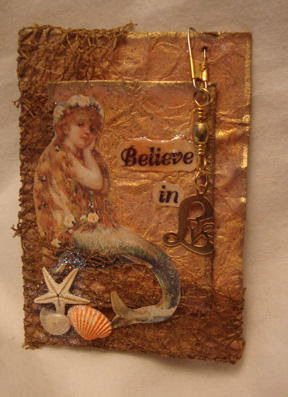 After attaching it to my ATC chipboard,I added a very thin layer of glossy accents over the top using my finger. I typed "Believe in" onto typing paper and highlighted the words with glossy accents. I attached the shells with glossy accents too. I dangled a "Love" charm from a fishing leader.